The hype surrounding an El Niño winter continues to grow. The forecast released in early August 2018 from the United States' Climate Prediction Center's (CPC) shows a 70% chance of El Niño conditions during the 2018-2019 winter season. Ocean water temperatures across the world influence the tracks of winter storms. One area of ocean water temperature that has the biggest impact on winter storms in North America is the central Pacific Ocean. This is the location of El Nino and La Nina. Thanks to decades of research, scientists now have a decent ability to predict the strength El Nino and La Nina months in advance. This means that even now in late summer, we are looking ahead to the temperature of the ocean during the upcoming winter, and it's these water temperatures that can influence the tracks of our winter storms. What and where is El Nino? The water temperature in the central Pacific Ocean flips back and forth between warmer than average and cooler than average. La Nina means that water temperatures are cooler than average. El Niño means that water temperatures are warmer than average. El Niño was originally recognized by fishermen off the coast of South America in the 1600s, with the appearance of unusually warm water in the Pacific Ocean. The name El Niño, or 'Christ child', was chosen because these warm-water events happened to around the Christmas holiday. The images below (courtesy of NOAA) show ocean water temperature compared to average in the Pacific Ocean. The top image is La Niña, showing cooler than average water temperature. The bottom image is El Niño, showing warmer than average water temperature. What does all of this mean for snow during 2018-2019? The water temperature forecast is for a 70% chance of a weak or moderate El Nino. To forecast snow for the upcoming winter, we can look back on previous winter seasons with weak or moderate El Ninos to see snowfall patterns. The past can be a useful guide to the future, but it is NOT a perfect predictor of where the snow will fall. 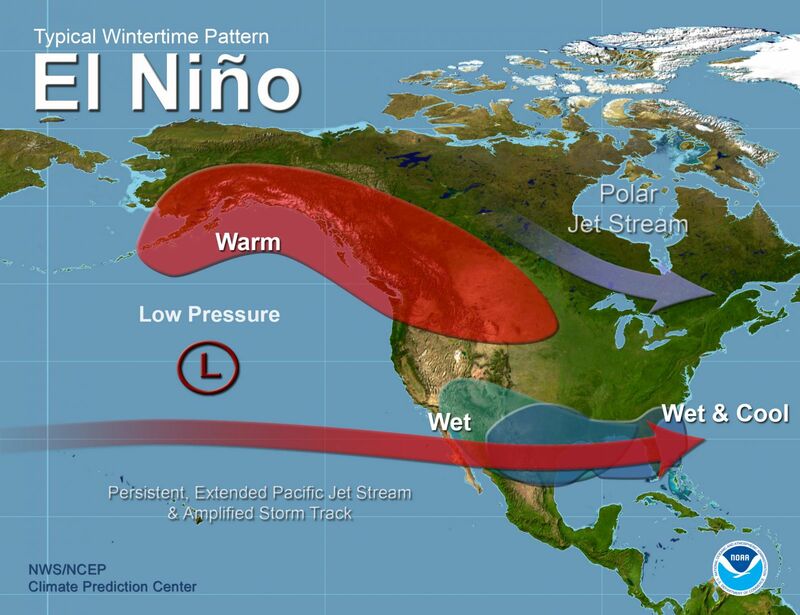 The map below shows the precipitation during the winter (October – April) during 10 previous weak El Nino seasons. Green is above average, white is near average, and orange is below average. Verdict: A weak El Nino often brings below average precipitation for most of the western United States. More favorable conditions (average precipitation and cooler temperatures) could come to the eastern mountains of Montana and Colorado, the southwest, and the northeast. The map below shows the precipitation during the winter (October – April) during 7 previous moderate El Nino seasons. 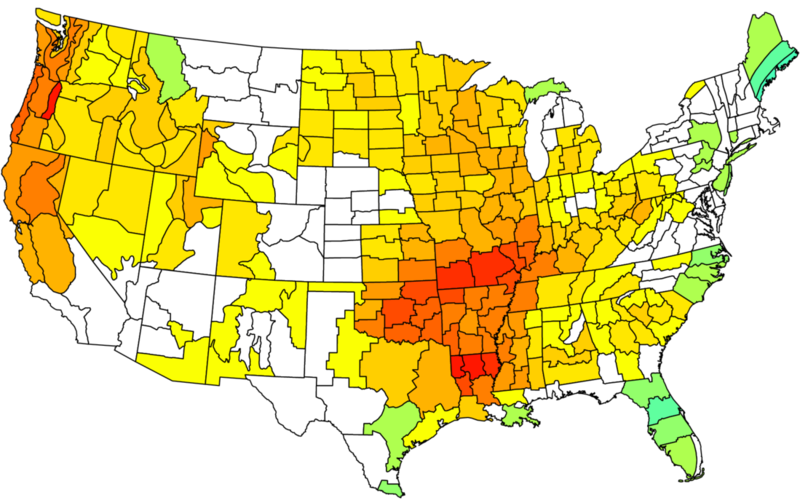 Green is above average, white is near average, and orange is below average. Verdict: A moderate El Nino is better (more snow) than a weak El Nino for most of the United States. Many areas of the west have seen average to above average precipitation during moderate El Ninos while the Northeast is mixed with more precipitation closer to the coast. The zero line in the graphic below indicates average water temperatures. Above that line would be warmer than average water temperatures. The squiggly lines on the right side of the graph all show a forecast for above-average water temperatures heading into this winter. If we can get to 0.5 degrees C above average, that would be a weak El Nino. If we can get to 1.0 degrees C above average, that would be a moderate El Nino. The average of all the squiggly lines is about 1.0 degree C above average water temperatures, so right on the border between a weak and moderate El Nino. You saw above that a moderate El Nino has (historically) delivered more snow than a weak El Nino, so let's hope for those water temperatures to be on the high side of the forecast. There is a lot of hype about El Nino. 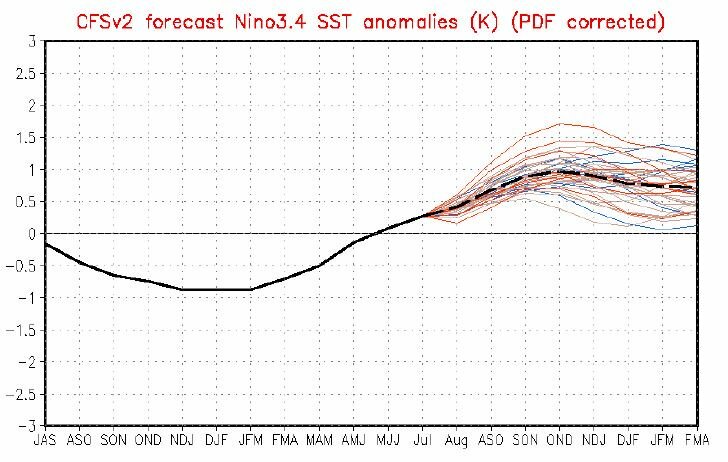 Odds of an El Nino for this winter are high (70%), but that's not a guarantee. If we do get a weak to moderate El Nino, remember that this can actually mean below average or average snow conditions for many areas of the United States. In the next few months, you'll come across numerous winter forecasts. These 1-6 month forecasts are rarely accurate. If you need to plan your ski trip months in advance, feel free to look at long-range forecasts for snowfall, but focus on factors that you can control, like exploring new terrain and activities, ease of travel, and being with friends and family. If your main goal is to enjoy deep, fresh powder, you'll need to watch the forecast closely through the season. Forecasts out to 7-14 days can guide you to areas where the weather is trending cold and snowy, and then you can nail down the exact day and location of the best snow about 1-3 days in advance. To see all the data you need to enjoy deep powder days, including detailed 1-10 day forecasts, consider upgrading to OpenSnow All-Access. Our Tahoe snow forecaster Bryan Allegretto dug into the details of previous El Niño winters – read BA's analysis.